Lord knows if this actually means anything, but I'm still over the moon to see that news portal Wikio has ranked meemalee's kitchen in the Top Five Gastronomy Blogs for August. 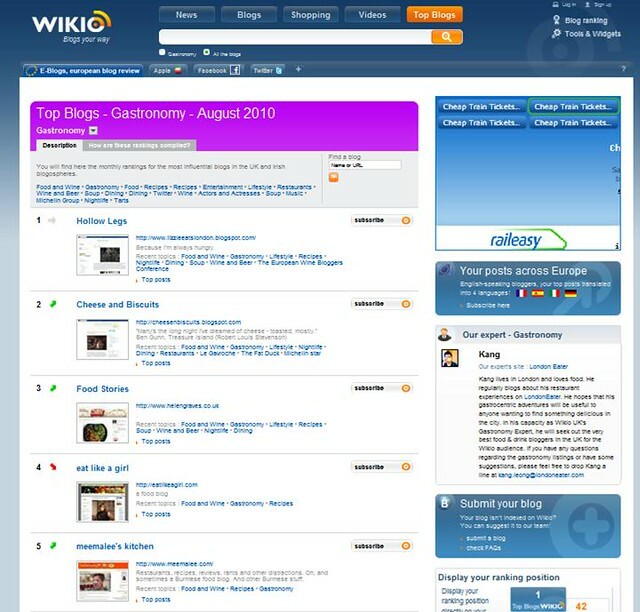 The position of a blog in the Wikio ranking depends on the number and weight of the incoming links from other blogs. These links are dynamic, which means that they are backlinks or links found within articles. Only links found in the RSS feed are included. Blogrolls are not taken into account, and the weight of any given link increases according to how recently it was published. We thus hope to provide a classification that is more representative of the current influence levels of the blogs therein. No, I don't really know what that means either. Sorry to burst your bubble MiMi but all of this ranking doodah means absolutely nothing. I mean after all Where's My Pork Chop? is ranked at 1578. I don't know how they compile the data but going by that position, Wikio obviously haven't got a bloody f**king clue what they're doing, I mean for f*ck sake what does a guy have to do push his f*cking blog up there? EH? EH!??! My view of the Wikio ranking system is that it's really good in the months I go up, and a load of rubbish in the months I go down:-). I've had my highest ever ranking this month, 32 in politics and 70 in general. @Dennis K - Thank you Dennis - and happy Friday 13th to you too! Don't care whether Wikio is meaningful or not, your blog is one of my faves regardless. That said, I had my highest ranking with them in a month when I didn't post much, nor were there many incoming links to me that I was aware of. And then, the 4-5 months after that, as visitor numbers and inbound links from other blogs increased hugely, my wikio ranking plumetted! But if I did a Kaveyio ranking, you'd be right up there too! Your blog is one of my faves too,but there are others that I really like which are really obscurely positioned. PS Thanks for the tip re the noodles going to try them. @Northern Snippet - You're welcome! Well done Meemalee, if nothing else these rankings are a good indicator that one's blog is on the right track, relevant and interesting. I was chuffed to have my first proper gastromony ranking at 71. I hope to reach your heady heights one day!